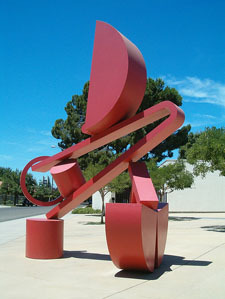 The Fresno Art Museum, located in Fresno, California was created to collect, save and show the many valuable tangible artifacts of art and history. Their displays span a wide array of contemporary and modern works by local, national and international artisans, with the extra emphasis of Mexican art from the pre-Columbian period to the current day. Since it is the only modern art museum between San Francisco and Los Angeles, it has become the sole public access art museum in central California, giving the 1.6 million residents of the region a forum for modern and contemporary artworks; with films, lectures, exhibitions, docent tours and symposia that provides the community with a way to educate, provoke, enlighten and entertain visitors to the region. About 10,000 students benefit from the museum each year, and as the museum is located in a culturally diverse region, they must face the realities of change and cultural diversity every day, which in turn effects the exhibits and collections that come here. The museum has become somewhat of a publishing expert since 1980, they have made over 20 catalogs that pertain to such interesting topics as pre-Columbian sculpture, the works of Viola Frey, David Smith, Robert Cremean, June Wayne, Darren Waterston, Terry Allen, Betye Saar, and Milton Avery. Emphasizing American sculpture, works on paper, Mexican art from pre-Columbian periods and art from the state, the museum has always had a clear understanding of its role in the community. Starting in 1948, the museum has grown into a prominent museum of modern and contemporary artworks. Among the permanent collections is the Earth, Fire & Stone: Kenneth E. Stratton Collection of pre-Columbian Mexican Art, that opened in 1992 and included many beautiful pieces of ceramics, set in such a way as to help you see the actual burial sites where these marvelous pieces were discovered. These collections sit in the Hans Sumpf Gallery that was donated by the Sumpf family when learning of the fabulous collection offered by the Stratton Collection. The two men were great friends during their lifetimes and it is perfectly fitting that the two should have this last unique opportunity to show the public the many works collected by Stratton; which were made long before the Europeans came to this country and date from 500 to 2500 years ago. The many examples of relics belong to various groups that included the Nayarit, Olmec, Tlatilco, Chupicuaro, Colima, Jalisco, Oaxaca, Lagunillas, Veracruz and Teotihuacan. Another permanent collection is the Peruvian Pre-Columbian Textiles and Artifacts from the Janet B. Hughes Collection of Peruvian Pre-Columbian Art, that was donated to the museum by the great weaver Janet Hughes in 1995. Over 650 relics from the southern end of Peru were given to the museum by Janet, with many wondrous textiles and ceramic relics that included carved wooden objects that contained ceremonial vessels called keros, and many old textiles that came from the tombs of Peru. Yosemite National Park is one of the biggest national parks in the country laying in the many counties of east central California spread across 760,000 acres, and the Sierra Nevada mountain range. The park is visited by over 3.5 million each year, with the majority spending most of their time in the Yosemite Valley, a small 7 square mile area. It was named a World Heritage Site in 1984 and is known all over the world because of its fantastic granite cliffs, clear streams, giant Sequoia groves, waterfalls and biological diversity. It is amazing that almost 95% of the park is considered wilderness, and though it wasn't the first national park, it was important to the development of the national park system and people like John Muir and Galen Clark. It is one of the biggest and least fragmented habitat blocks in the Sierra Nevadas and this park supports many wonderful plants and animals. The elevation is from 2000 to 13,114 and holds 5 main vegetation zones; the lower montane, subalpine, upper montane, alpine and chaparral/oak woodlands with half the state's 7000 plant species being located here and almost 20% located in Yosemite. The landscape holds over 160 rare plants, with numerous rare geological formations and unusual soils that allow these plants to grow and thrive. The geology of the region is featured in the granite rocks and the remains of much older rocks. The park is located in the central Sierra Nevada range of the state, taking 4 hours to travel here from San Francisco, 6 from LA, 7 from San Bernadino and just an hour and a half from Fresno. Surrounding by massive wilderness areas like the Ansel Adams Wilderness in the southeast, Hoover Wilderness in the northeast and Emigrant Wilderness to the north. It is almost the size of Rhode Island spanning 1,189 miles, with thousands of ponds and lakes, 1600 miles of streams, 350 miles of roads, and 800 miles of fantastic hiking trails. 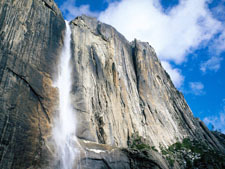 The Yosemite Valley takes up only about 1% of the park's huge area, but it is the place where the majority of visitors come and stay, since El Capitan is one of the most prominent granite rock cliff's that overlook the valley and has become a favorite of rock climbers, out of all in the world, since it can be accessed all year long, and there are so many varieties of climbs and formations. The high country or chaparral has such magnificent portions like the Cathedral Range, Dana Meadows, Kuna Crest, Clark Range, and Tuolumne Meadows. There are also three incredibly impressive ancient giant Sequoia groves that contain about 250 of these giant trees stretching high into the blue skies. There is so much to this fabulous park, that the only way to really appreciate it is to go there and plan on spending some time since it all so enjoyable, serene, and peaceful; nowhere can be heard the constant rush of traffic, planes or trains that explode into your hearing and thoughts.